Lillian Ruth "Lil" Doerksen: teacher and missionary; born 17 March 1921 in Herbert, Saskatchewan to Jacob Doerksen (15 April 1896, Osterwick, Chortitza, South Russia - 15 May 1967, Abbotsford, British Columbia) and Elizabeth (Nickel) Doerksen (22 August 1894, Alexandrovka, South Russia - 28 June 1956, Abbotsford, British Columbia). She was the third child in a family of six daughters and four sons. Lil was baptized in 1936 and joined the Main Centre Mennonite Brethren (MB) Church. Lillian died 9 October 2008 in Vancouver, British Columbia. Following her public school training Lillian attended Briercrest Bible Institute for two years (1937-1939), after which the family moved to Abbotsford, British Columbia. For the next seven years Lillian lived and worked in Vancouver, finding employment at the T. Eaton Co. (formerly Spencers). In 1946 she decided to continue biblical training and enrolled at the Bible Institute of Los Angeles (now Biola University). She sensed a strong call to mission work and became aware of the Pandita Ramabai Mukti Mission in India, a mission founded by Pandita Ramabai, a very intelligent Brahman who had converted to Christianity. 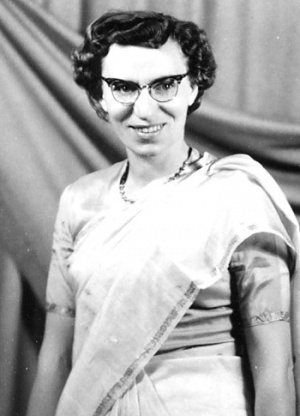 Lillian, after leaving Biola and taking a one-year teacher training program (Vancouver Normal School: 1947-1948), left for India in 1950 where she spent over 50 years as a missionary educator (38, until retirement at age 66, at the Ramabai Mukti Mission and the remaining years in founding and establishing, in 1987, the Maharashtra Fellowship For Deaf mission in the nearby city of Poona). During Lil's years at Mukti she became fluent in the Marathi language, organized the many girls at Mukti into multi-age families, and was instrumental in having India publish a commemorative stamp in honour of Pandita Ramabai. However, nothing gave her greater joy than raising a family (Honeysuckle Family) of 34 girls, many of whom went on to post secondary education and successful, arranged (approved by Lil) marriages. Several were adopted and today live in North America. Lillian was known as "Prakash Moushi - Auntie of Light." Regretably, one or more of her married "daughters" had deaf children born to them. This and the fact that there are some 900,000 deaf in the state of Maharashatra, motivated Lillian to found the Maharashtra Fellowship For Deaf mission in 1987, following her retirement from the work at Mukti. Today there are four locations where this work is promoted under the direction and leadership of another of her "daughters," Tara, and her husband Arvind Meshramkar. These live-in sites minister to and care for hundreds of deaf boys and girls. They are trained in one or more life skills, cared for in every way possible and given the opportunity to hear and respond to the gospel message. While at Mukti Lillian was principle of the elementary school, instrumental in having a high school added and director of the publicity department. Lillian authored and published the monthly Mukti publication Buds and Blossoms in which the stories of many of the Mukti children were told. Lil also authored the book Monkeys, Snakes and Miracles as well as Tragedies and Transformed Treasures. A good part of Lillian's life story is described in her biography, Light To India, co-authored with Dan Wooding, a book in which Dan, a professional writer, refers to Lillian as the Protestant "Mother Theresa." Her outstanding missionary work in India was recognized in February 2004 by Biola University, her alma mater, by presenting to her the President's Award. Her published obituary in The Vancouver Sun attracted the attention of two major papers, the Vancouver-based Province and the Canadian-wide Globe and Mail, who separately, wrote and published feature articles describing her life and work. Csillag, Ron. "Missionary from Saskatchewan was Canada's Protestant Mother Teresa." Globe and Mail (November 18, 2008): http://www.theglobeandmail.com/servlet/story/LAC.20081118.OBDOERKSEN18/TPStory/ (accessed 30 March 2009). GRANDMA (The Genealogical Registry and Database of Mennonite Ancestry) Database, 5.07 ed. Fresno, CA: California Mennonite Historical Society, 2009: #19971. Ratzlaff, Viola. "Doerksen, Lillian Ruth (1921-2008)." Global Anabaptist Mennonite Encyclopedia Online. March 2009. Web. 21 Apr 2019. http://gameo.org/index.php?title=Doerksen,_Lillian_Ruth_(1921-2008)&oldid=101400. Ratzlaff, Viola. (March 2009). Doerksen, Lillian Ruth (1921-2008). Global Anabaptist Mennonite Encyclopedia Online. Retrieved 21 April 2019, from http://gameo.org/index.php?title=Doerksen,_Lillian_Ruth_(1921-2008)&oldid=101400. This page was last modified on 9 September 2013, at 18:43.